Gridlock, contentiousness, do-nothing …. these are all good descriptors of what the Republican Party has recently done to American politics. To progressives, this is very frustrating because we see government as an instrument for positive societal change. For Republicans, it’s rather meaningless. It’s difficult these days to locate a Republican who really cares about improving the conditions of all Americans, particularly those who are immersed in economic and social struggles. Republicans are in a bit of a quandary. They do not seem to care much about government, but they are compelled to value it at least to the extent that they seek the power that comes with being an elected official. Republicans are willing to sacrifice quite a bit so that they can be in positions of power to prevent government from acting on behalf of the common good. But then what? Have you ever looked at Senate Majority Leader Mitch McConnell? He seems to constantly have that smug look on his visage as nothing seems to faze him. The fact that nothing seems to be happening in and around the space that he occupies is not a matter for concern. He is a very content customer. His appearance is one that would lead others to conclude that he is just an old man who is amused by the passing world around him. 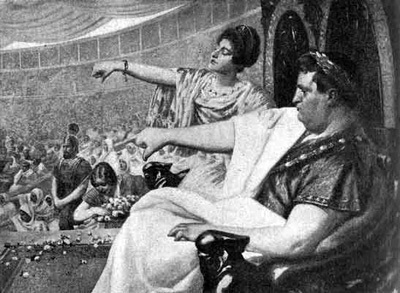 An historical comparison might be to Nero, the famous Roman ruler who fiddled as his city burned to ashes. It’s not just the Republican officials who are unconcerned about government doing anything to benefit the American people. It’s also a majority of the voters who put Republicans in office, particularly those who propelled Donald Trump to an electoral college victory. Getting these voters to see that they are being “What’s the Matter with Kansas-ed,” is a task for Democrats, at least progressive Democrats, to take on in upcoming elections. In the meantime, it has become apparent that Republicans really prefer politics and governance to be a reality TV show rather than public service. At the time when there were seventeen Republican candidates vying for the presidential nomination, Donald Trump was far and away the most entertaining. The media both recognized and promoted this notion, beginning with Trump’s “stairway from heaven” announcement of his candidacy. When the first Republican debate came along in August 2015, Trump was asked the first question from Fox News’ Megyn Kelly about his misogynistic treatment of women. He never even bothered to try to answer the question; instead he worked to amuse himself, Megyn Kelly and the audience. Ms. Kelly did not find his non-answer to be either informative or entertaining. But the audience did. It may have been at that very point that the sixteen other Republican candidates knew that they were confronting a force that could not be stopped. Part of the responsibility for this has to go to Democrats. Selling the idea that government can do good for people was very successful in the FDR-Harry Truman years and then the JFK-LBJ years. Unfortunately, the Clinton and Obama years did not further advance this notion. After the first two years of both the Clinton and Obama Administrations, Republicans mastered the art of gridlock. They combined that with a successful assault on many voters’ intelligence, which has lead us to politics being more for “fun” than for progress. It should not take long for a preponderance of Americans to see that they have been swindled by Trump and his fellow Republicans. This will matter only if Democrats can sell a convincing story of how government can work for people. It won’t work for Democrats to be “Republican-Lite.” They need to have a coherent progressive message and convince a preponderance of the American people that the laughs are over and now we have to pick up the mess. Next Post:Should Democrats obstruct Trump or try to minimize the damage?